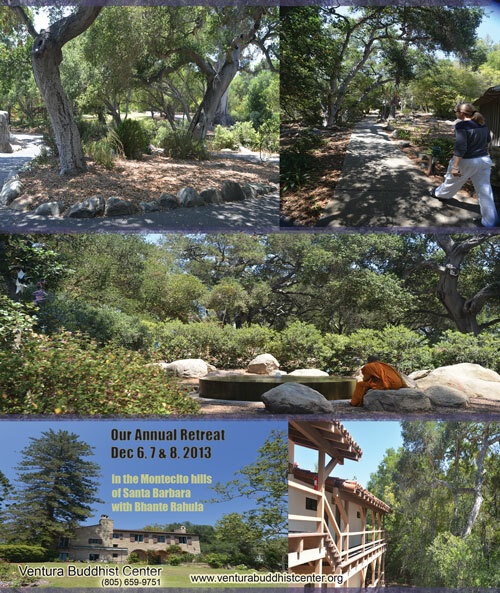 This year’s retreat will be held in a beautiful, 26 acre site located in the hills of Montecito, California, adjacent to Santa Barbara. In addition to the parklike setting you are sure to enjoy the comfortable rooms and gourmet-quality buffets. You are welcome to join us before dinner on Friday, December 6, 20013 for a stay extending until late afternoon on Sunday, December 8th. Now, for the third year in a row, our meditations will be directed by Bhante Yogavacara Rahula. Bhante Rahula has lived as a Buddhist monk for over 40 years and is an author and long-time meditation instructor. Born and raised in Southern California, Bhante Rahula was trained in the traditional, rigorous manner as a Buddhist monk in India and Sri-Lanka for many years prior to returning to the U.S. For decades since in this country, he has led in the training of new monks and has held teaching and leadership roles in his monastic community. For him, a particular area of interest is the integration of light yoga and more traditional sitting and walking meditation. His humor, simplicity and dedication will be apparent when you listen to his talks and when he answers your questions. Early registration is currently underway. To obtain the lowest rate you must reserve by September 30th. Click here to email for the current suggested donation-rates or to reserve now. Registration is running at a rate well above last year so we expect limited availability. This is a silent retreat. Therefore, there is no socializing, and talking is only as necessary. This includes the dining and sleeping rooms as well as the grounds. Extensive trails and paved walkways are available for either hiking in the hills or walking on the fairly level site. Handicap accessible accommodations are available. The all-you-can-eat buffets are included whether you are spending the night or attending for only during the day. Reduced rates based on need are available. For more information please email Bhante Sutadhara for more information. For availabilty and rates please email by clicking here or call Bhante Sutadhara of An-Lac Temple at (805)659-9751.